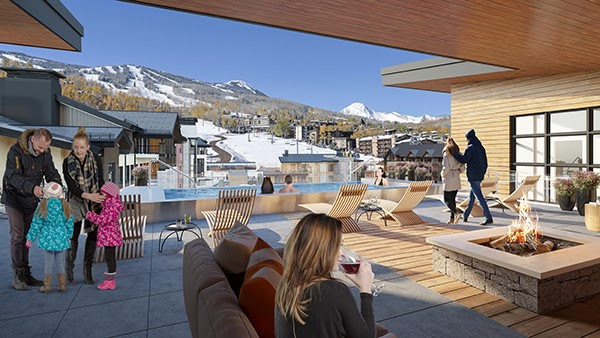 The list of special amenities and activities at One Snowmass with Inspirato makes every day an adventure! A perfect spot to après at the end of your day. Take a dip in the infinity-edged spa pool or just cozy up to the fire pit and enjoy the stunning views of Mt Daly, the ice rink and the night time stars. Stay in shape for endless outdoor adventure at the spacious 2,500 SF Fitness Center offering the latest and greatest equipment featuring Peloton bikes and Woodway treadmills. Located adjacent to the Fitness Center will be a Yoga Studio offering public classes and events. Dedicated lockers and long-term storage in the building will make schlepping gear a thing of the past. Ski locker rooms have direct ski-in/ski-out access to the slopes. Located off the plaza, the private Inspirato Lounge will offer owners and Inspirato members a place to unwind and socialize. One Snowmass also has storefronts in the planning phase on the plaza level and in the stunning “glass box” space with 180-degree views down valley and of the skating plaza. Eye Pieces, an optical boutique, was recently announced and a new medical center offering expanded healthcare facilities will also be contained in the building.